In May of 2009 I was hunting on a ranch in Central Namibia, near the capital of Windhoek. 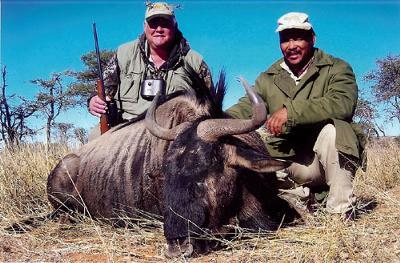 My objective for this hunt was to shoot an Eland and a Blue and Black Wildebeest. The Eland is the world's largest antelope. It can weigh more that 2000 pounds. The Blue Wildebeest is also called the Brindled Gnu because of the dark stripes on it's side which make for a beautiful skin or rug. The Black Wildebeest is also called the White-tailed Gnu because of it's long white tail. The Black Wildebeest is much smaller than the Blue Wildebeest. The Blue Wildebeest numbers in the millions in Kenya and Tanzania and constitutes a large portion of the animals that make up the annual migration that seasonally follow the grass in those countries. I had never shot a Wildebeest. I suppose every hunter in Africa must shoot a Gnu because they represent the symbol of Africa. Every school child knows what a Gnu looks like. When I arrived at the ranch I was greeted by the owner, Jan, and his wife, Marie. They were gracious hosts. They had the help bring my belongings to my room. Jan would be my guide and the Namibian raised Professional Hunters, Franz and Johannes, would drive for me and stalk with me. The first thing to do was sight in my Ruger .300 Win Mag rifle. I had no worries about the accuracy of the rifle because my rifle had previously been finely tuned by Michael Duvenhage at Uitspan. Franz set up the targets and I shot one shot in the direct center of the target at 100 yards. Jan said that was good shooting. After sighting in the rifle we drove around the ranch. We saw a large herd of Black Wildebeest, many Springbok, Red Hartebeest, Ostrich, and Blesbok. The ranch was full of game. There were also many varieties of birds. We saw two large Secretary Birds sitting in a nest, Sand Grouse, three types of Doves, Francolin, a Reichsvogel or bird that had the colors of the old German flag, Kori Bustards, a Martial Eagle, a Pale Chanting Goshawk, and many Hornbills. The sun was setting. We went back to the ranch house and Jan showed me to the Bar. He offered me a Windhoek Draft Beer which was cold and delicious. Jan gave me the rules of rifle safety for the ranch. He also showed me a book that showed where to shoot the animals in Africa. In Africa it is best to aim low just in front of the front shoulder. Usually I shoot animals just behind the front shoulder but the book said to shoot way low. I told Jan that I would follow the book. Marie served dinner. During dinner Jan told Marie,’This Man can Shoot”. I was thankful to Michael Duvenhage for sighting in my rifle. Praise like this from an esteemed hunter like Jan is very welcome. The dinner consisted of well aged Gemsbok steaks. They were very good. After Dinner I went to my room and organized my gear. I slept well that night. For the next three days, Jan, Franz, Johannes, and I hunted hard and harvested a few exceptional animals. We hunted with a Land Rover and we sat at a water hole for Eland. I was very successful and shot a Duiker that scored 35.8; Gold is 28, a Steenbok that scored 35; 28 is Gold, a Gold Medal Eland Bull, A Game Fields Medal Black Wildebeest, a Gold Medal Red Hartebeest, and a Gemsbok for meat. The Blue Wildebeest eluded us. Jan knew that there were five old bulls that were separated from the main herd. We search high and low for the Blue Wildebeest with no success. One crisp morning there was frost on the long yellow grass. We drove steeply up into the mountains and glassed the area on the next mountain for Blue Wildebeest. Franz saw some stripes far below. There was a herd of Gemsbok, a herd of Zebra, and a few Blue Wildebeest. We got out the shooting sticks and I followed Franz after the Wildebeest. Jan radioed Franz and said he would come to pick us up. We would not get the Blue Wildebeest that day. That night, over a cold Windhoek, Jan said that we would hunt tomorrow morning for the Blue Wildebeest and cook a Duiker Potjie in the evening. Marie would be in Windhoek and Jan would cook for me. I had mentioned that I had enjoyed a great Duiker Potjie on Uitspan. The Duiker that I had shot was well aged and Jan said it would make a fine Potjie. The next morning there was frost on the long yellow grass, again. The ranch was beautiful with it's numerous Acacia tress and long grass with the Mountains in the distance. We again drove up into the Mountains. Franz with his sharp eyes spotted the long lost herd of five old bull Blue Wildebeest. Jan was overjoyed and gave Franz a $100 bonus. The bulls were far below and it took an hour to get to them. Finally we got close to the Wildebeest. One old bull was very curious and stood looking at us at 180 yards. I took careful aim and hit the Wildebeest solidly. He dropped to his feet. Jan and Franz congratulated me. We went up to the Wildebeest and Jan conducted his ceremony after harvesting an animal in the old German tradition. Jan cut three green sprigs. He laid one on the animal's belly to venerate the beast and give it the Hunter's respect. He put one sprig in the bull's mouth to signify it's last meal. Jan put some blood on the last sprig and gave it to me to insert in the left side of my hat for 24 hours. Jan said;"Weidemann's Heil" as he handed me the sprig. It meant, "Hail the hunter. Good hunt!" I replied, "Weidiemann's Dank" ;thus giving my thanks. It was a very profound ceremony and we took it seriously. It was the ultimate respect for the animal and the sport of hunting. Jan, who is an official SCI measurer, taped my bull and he scored 162; not enough for a Gold, a Silver, or even a Bronze. However this was an old, old, venerable animal who had sired many sons and spread his genes throughout the herd. His teeth were missing and well worn. His horns were broomed and broken. In the old German Tradition carried on in Namibia, Jan gave the bull a Conservation Medal. German hunters are entirely satisfied with an old animal; not necessarily an animal with the longest horns. We went back to the ranch house. I watched Franz and the skinners process my Blue Wildebeest. Jan got his Potjie pot, made a fire under the pot, added Duiker, vegetables, and a lot of white wine. He cooked it for five hours, continually adding wine to keep it from drying up. While we sat around the Potjie Pot, Jan scored my animals, added up my bill, and did other paperwork for my hunt. Franz brought me the Wildebeest’s heart and showed me where the bullet grazed it. I took the heart and pretended to take a big bite out of it. It was all in good fun and we took some pictures. Jan got out some Jack Daniels and poured me a shot. We celebrated the hunt and the Blue Wildebeest and blessed the Duiker Potjie, which was very good. It had been a wonderful hunt on a beautiful ranch with some very nice people. Thanks to the author for telling his story of an Ethical Hunt which dealt with the utmost respect for the beast that was hunted. ...It's always nice thing to learn something new. The Wildebeest, the ceremony of the hunt in the Germanic tradition are all new to me. Thanks again for a wonderful story. I liked the part of the hunting and then having a shot each time you shot an animal. You must have been happy every night because you shot something ever day. I also like the cooking with the wine. The old German hunting tradition was interesting to learn.